omega 3 fats from marine sources and a proprietary blend of organic minerals. • Turkey & Pork is formulated using the guidelines set by AAFCO, the world’s leading authority on pet food nutrition. 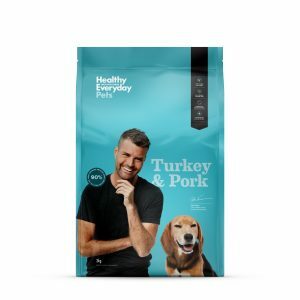 Ingredients: Turkey and Chicken Meal, Pork Meal, Beef Meal, Tapioca/Cassava, Beef Tallow (preserved with mixed tocopherols), Fish/Tuna Meal, Natural Beef Flavours, Alfalfa, Marine Fish Oil, Coconut Oil, Arrowroot, Whole Egg Powder, Yucca Shidigera, Kelp, Kale, Parsley, FOS, Hydrolysed Yeast, Turmeric, Glucosamine, Green Lipped Mussel, Vitamin Supplements (A, D, E, K, B1, B2, B3, B5, B6, B9, B12, Choline, Biotin), Organic Trace Mineral Supplements (Zinc, Iron, Copper, Manganese, Iodine, Selenium), Natural Antioxidants (mixed tocopherols and rosemary extract) Vitamin E, Taurine, Vitamin C., Probiotics (Bacillus subtilis, Bacillus licheniformis) and multi-strain enzyme blend.